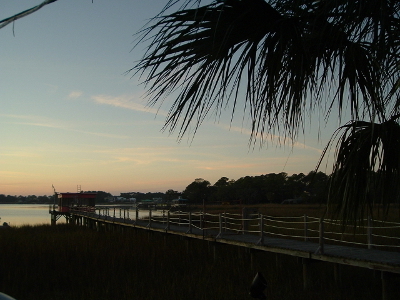 I have one more batch after these of Tybee pictures to post. Understand, these are only the ones that are tangentially doorish. I have many pictures I’m not posting, so count your blessings. My friends and I were crazy about The Crab Shack, but we met some folks while we were out walking who sneered at the very idea of The Crab Shack. 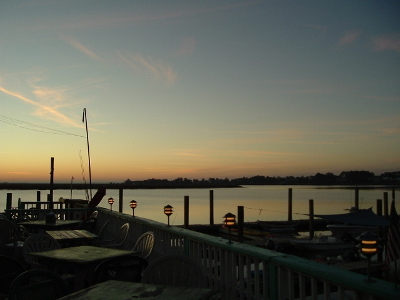 The best place for seafood on Tybee Island, they insisted, was A.J.’s Dockside, especially at sunset. So we went. 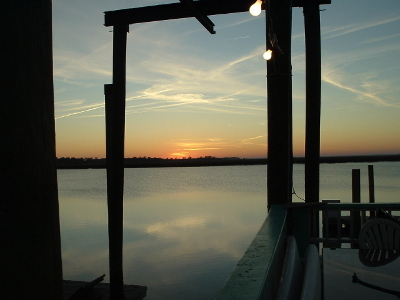 We liked The Crab Shack better — it was certainly funnier — but you couldn’t beat the sunset. Here’s A.J.’s. As God is my witness, there’s a door in there, somewhere. Guess what time of year we visited. The sunset was spectacular, as advertised. I guess this is kind of a door. Ish. Next door was a fishing hut at the end of a dock. Very picturesque. Here’s a better shot of the fishing hut WHICH HAS A DOOR. And so we bid farewell to A.J.’s and went back to the cottage to put calamine lotion on our mosquito bites. But it was beautiful. This has been a pretty feeble example of Norm Frampton’s wonderful Thursday Doors link-up. Visit and see some REAL door posts. –Door posts! See what I did, there? A WRITING PROMPT FOR YOU: A character goes to a highly recommended restaurant and is disappointed. Why? This entry was posted in Thursday Doors. Tagged food, Georgia, Savannah, Tybee Island. That’s a gorgeous sunset. I saw one last night on our evening sail and snapped a zillion photos! Looks like such a peaceful spot – I’ll definitely make a point of checking it out if ever I’m in that area. It’s just off the coast of Savannah. There was a lot I’d like to see in Savannah, but I couldn’t stand to leave Tybee! I never went to AJ Dockside’s. When we first moved the the area people went on about Love’s which is also waterfront, but um, the beautiful view and the excellent service did not make up for the high prices on the mediocre food. 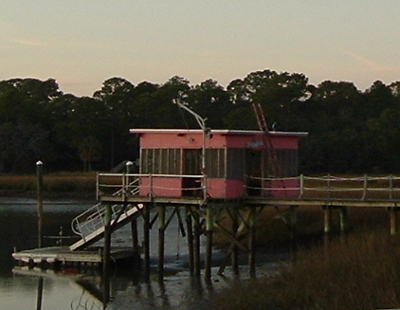 Thanks, Joey — The boathouse looked funny sticking out there, all pink in the green and blue, until the sunset caught up with it and it blended right in! No kidding, I almost posted a crab shack “opening” door-isch as you say, but it didn’t fit with my post! Looks like a fun outing Marian! And you DO have a door in that pink building at the end of the pier:):) Have a great weekend! Hi, Jesh! We had such a deeply delightful time on Tybee. I could have spent the whole winter there with my writer pals, just walking the beach and writing. And eating, of course! Well, speaking of the Crab Shack – you’ve made me lazy and I am going to repost a post from 2013 on that very subject. 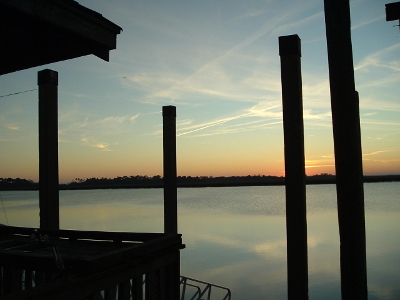 I don’t know the next time I will be in the Savannah area again but I must say, that is one lovely sunset. Ooo, great, Alana! I’m looking forward to that post, as I do to all your posts! Beautiful sunset. I tend to stick with the places I like, I take recommendations, but only from certain people. Yeah, well, we thought locals would know the best places to eat. And maybe it WAS better than The Crab Shack, and we’re just too uneducated in seafood to know it. 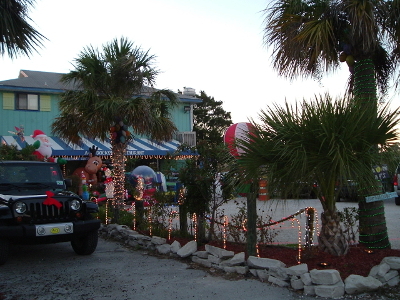 Or maybe they just sneered at The Crab Shack because it’s too touristy for them. ‘Course, we were tourists, so The Crab Shack was right up our alley. Plus: cats, parrots, and A SKELETON IN A SANTA SUIT! Yeah, baby! I’ve heard that Tybee is wonderful. Your photos back that up. Tybee IS wonderful. If anybody ever offers you a free stay there, take it! Wow! Magnificent view . My sister visited the place last month and suggested me to take my wife there! I should take her advice, I guess. Absolutely! It’s beautiful there. I don’t know about the summer, because we went in the winter. The weather was mild and the beaches and town were not crowded. With those views I’d have forgotten the door too!!! This was back before I had door fever, so I’m just lucky I got anything door-ish at all. lol!